Looking for the best camping water filter for your next outdoor family adventure? Well, we’ve got it for you. It’s priced right. It’s easy to use. It’s light. And it works really, really well. Best of all, it’s made by an outdoor company who puts their money where their mouth is when it comes to caring about the backcountry. It was a load of crap. Pretty much literally. So much so, Outside Magazine addressed the story head on with a story a week later called, “Actually, Slate, You Really Should Filter Your Water.” Outside’s story backs up their stance with loads of research proving most North American water sources are risky and require some filtration. And let’s face it. The safety of your kids is worth the effort, right? While common waterborne microbes such as giardia, e. coli, and cryptosporidium induce minor illnesses in adults, the effects can be much worse for kids. The Center For Disease Control states that giardiasis in children can may lead to symptoms as severe as delayed physical and mental growth, slow development, and malnutrition. Bottom line: don’t risk it. Get a camping water filter or purifier for your next family outdoor adventure. Which brings us to the next question. CAMPING WATER FILTER VS. WATER PURIFIER? The difference between camping water filters and water purifiers is simple. Water filters remove two of the three pathogens found in water: protozoan and bacteria. Water purifiers remove all three: protozoan, bacteria, and viruses. Camping water filters are all you need for backcountry family adventures in the United States and Canada. 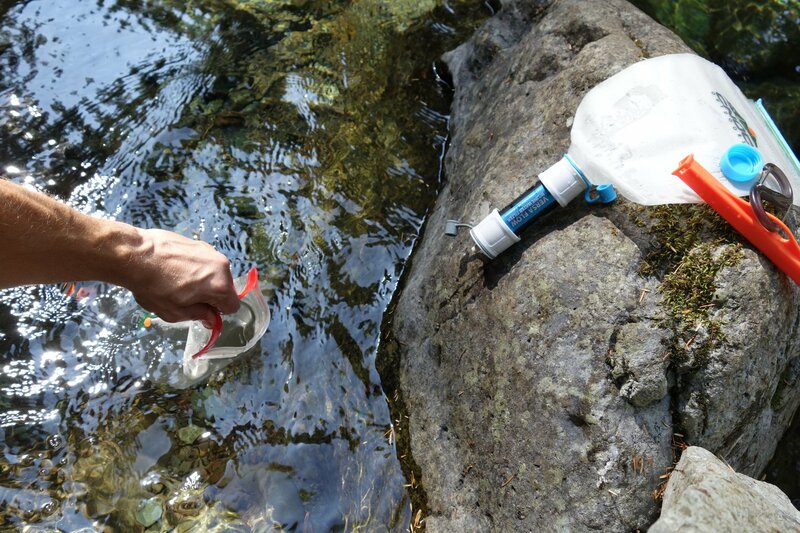 Water filters will cover you for camping, backpacking, and road trips. The risk of viruses being found in North American water sources is almost zero. However, if you’re traveling outside the U.S. and Canada to lesser-developed countries, the risk of viruses in water sources, including tap water, increases. You’ll want a water purifier for these international family adventures. So, who makes the best camping water filter for outdoor family adventures? Never heard of them? I hadn’t either until recently. Cnoc, pronounced “K’noc,” is a Gaelic word meaning hill. Cnoc Outdoors is an American company based in Portland, Oregon. They believe in the Leave No Trace philosophy and carry these principles into their designs. The result is minimalist (and lightweight) outdoor gear that is thoroughly tested and built to last. It’s called the Cnoc Vecto & Versa Gravity Flow Water Filter. I’ve used a half a dozen different filters over the years, and I can honestly say, Cnoc’s is the best camping water filter I’ve used. Let’s start with the basics. It’s light: only 8.3 ounces. It’s easy to use: only 4 parts. It’s fast: it filters 2 liters of water in 3 minutes. It’s efficient: it filters out 99.999% of all bacteria and 99.999% of protozoan. It lasts a loooong time: up to 100,000 gallons. It’s priced right: only $44.99 for the whole water filtration system. 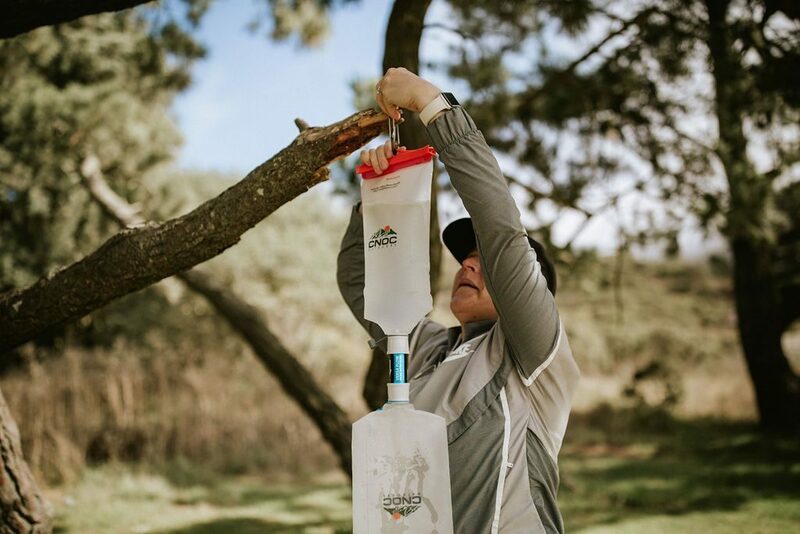 So, Cnoc’s Gravity Flow system is made up of two BPA-free Vecto water bags, a Versa Flow water filter, and a tough little carabiner to hang the system up and let gravity do its job. That’s it. The bags are color coded so you don’t mix up the clean water bag (blue) with the dirty water bag (orange). The Versa Flow water filter is a beast, filtering out 99.999% of bacteria including E.coli, salmonella, and cholera. It also filters 99.999% of all protozoan, including giardia and cryptosporidium. In addition, a single filter will last for up 100,000 gallons of water. That’s about as good as it gets. Cnoc’s Vecto & Versa Gravity Flow Water Filter is totally kid-friendly. It’s a great tool for teaching kids about water issues and the importance and challenges of making clean, drinkable water. The other reason this camping water filter is great for kids is it’s simple to use. So simple, my 8-year-old was able to put it together all by herself on our last camping trip. She felt proud she was able to make clean water for the family. And that’s great, because now collecting water can be my kid’s job when we go camping and backpacking. One less job for dad. Yes! Need more ideas for practical, must-have camping gear for kids and parents alike? Check out the best long underwear that just so happen to look like ninja suits. Next Next 5 RV Travel Hacks For Dads…They’re Genius!